In January 1998 the 10-City Index was at 82.7. If home prices had followed the 3.35% annual 100 year trend line, then the index would have arrived at 126.7 in October 2010. 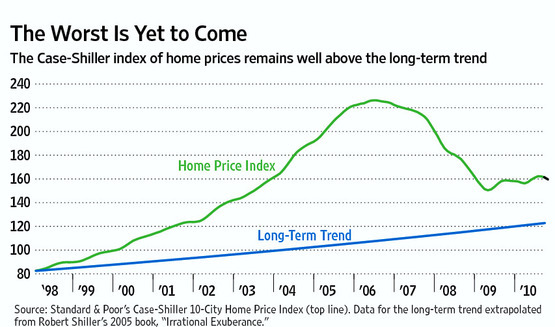 This week, Case-Shiller announced that figure to be 159.0. This would suggest that the index would need to decline an additional 20.3% from current levels just to get back to the trend line.